The Lulzbot AO-100 was a gift from Aleph Objects- we won a contest where we wrote to say why IG was awesome, and what we could do with a 3d printer. We received the printer in May 2013, and it's done a lot of good work for us. It has made countless prints, and it's been our primary "outreach 3D printer"-- we've taken it to lots of cool places to show members of the community how 3D printing works. The machine has been fairly reliable, not counting two hot-end rebuilds and several software tool chaing upgrades. The current tool chain for the Lulzbot is Repetier Host running on Linux. 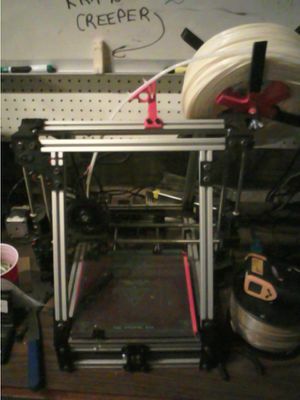 The Lulzbot is currently connected to a Linux computer named Tesla. See Lulzbot Help for help using the Lulzbot. This page was last modified on 19 January 2016, at 03:07.